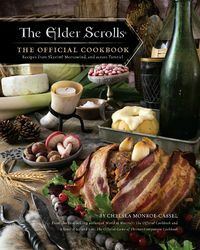 In 2019, UESP looked for questions to ask Chelsea Monroe-Cassel, the author of The Elder Scrolls: The Official Cookbook. The questions were sent on March 5, 2019; Chelsea's answers can be found below. Her blog, The Inn at the Crossroads, features many other recipes, as well as some behind-the-scenes information about the Elder Scrolls cookbook. When did you discover The Elder Scrolls? What's your favorite game in the series? Do you have a favorite race? I think I learned about TES around the time of Morrowind. I remember I kept getting into trouble because I love exploring the world, but there are a lot of places you can't go without being killed immediately or being accidentally turned into a werewolf or something. So Skyrim was a better fit for me because I could wander around, taking screenshots, basically playing the tourist. I frequently play as a Breton because I like to throw magic around, and I think they've got some good food. What made you decide on TES for a cookbook? Despite a lot of the food in the games being pretty simple, it's nonetheless very enticing. Grilled Leeks? Yes please! Sweetroll? I'll take two! So it's a game that really speaks to a lot of people on the food level. I've had a lot of requests over the years to make recipes from the game, so I was excited to take on the project. Were there any lore details that you found particularly interesting when doing research for the book? Absolutely! There's a wealth of detail in the game about the food, if you really listen for it. For example, did you know that frost salts are used in Skyrim to preserve meats? Or that the Saan family imports the spices they use to make their famous spiced wine? When creating the recipes for the different races, did you decide that each race's food would be based on a specific culture's food, or did it vary depending on the recipe? Oh, absolutely. Every race and region of Tamriel is unique, which is part of what makes the games so enticing. While there would be a lot of crossover eating (who doesn't love a sweetroll? ), I wanted to make sure there was at least one recipe for each race, so that all players felt represented. Were there any recipes that you thought about, or tried to make, but couldn't include? There are a couple of really interesting sounding cocktails that are served in the bar in Riften (The Bee and the Barb), but I couldn't quite make them work consistently enough for the book. I'm still hoping to revisit them on the blog, though! For any of the recipes that require somewhat unusual ingredients that may be difficult to find in a typical grocery store (such as the rosehips in the Snowberry Cordial recipe), where do you recommend finding these ingredients? Thankfully, a lot of more obscure ingredients can be readily found online, or locally in health food shops that have a bulk section. I also really enjoy poking around international grocery shops, because I never know what amazing new ingredient I might discover to play with. Can you walk us through the design process of one of the recipes from the book? We were intrigued by the use of apricots in the Skooma recipe. What was the inspiration for this? Well, since I couldn't make/use real Moon Sugar, I had to improvise. The Khajiit always strike me as a sort of blend of North African and Mediterranean influences, and I associate that part of the world with a lot of fresh and dried fruits. I went through several different versions of Skooma before this one, but I really liked the delicate flavor that the apricots give it. It's almost like you can taste the sun-driedness of the fruit in there, and that's really cool. What was the most difficult prop to make/find? I actually made a number of the backdrops that you'll see in the book, from a mossy stone wall to part of a door from Whiterun (there are some side by side shots on my blog). There are some amazing prop creators out there, and their tutorials were invaluable. Most fun prop to make was the horn candle holder. It might look like wrought iron, but it's actually reinforced foam that I hit with a dremel. Surprisingly sturdy, and really brought the look of some shots together. Do you have any funny stories from working on the cookbook? I have a lot of willing friends and family over to help me eat the food I make when I'm in full testing mode, but sometimes the recipes are a little quirky for folks. I like to make them guess what's in a recipe and see how close they get. So far nobody has guessed the secret ingredient in the Horker Loaf, though! When did you begin cooking? How did you get into writing fantasy cookbooks? I was actually a picky eater growing up! It wasn't until I did an exchange year in Turkey after high school that I discovered I really loved food- no wonder, since that's some of the tastiest cuisine on the planet. Despite that terrible childhood trait, I had always been drawn to the descriptions of food in books. Brian Jacques' Redwall series has incredible descriptions of food, from berry cordials to watercress sandwiches, and I think that's probably where I first got the idea that these foods could be made real. Some friends and I made a Redwall feast when I was probably about 12, and it was really fun. What was the first fantasy-inspired dish you made? Do you still like it? There was one dish in that Redwall feast that I've never been able to duplicate- it was some sort of an apple pudding, and I just thought it was the best thing, although time and memory have probably altered the reality of the dish. Later, when a friend and I started the Game of Thrones food blog, our very first dish was lemoncakes. That recipe evolved a lot over time, too, but I still make them occasionally. We even painted our kitchen "lemoncake yellow" that year. Do you have a favorite ingredient? I'm all about seasonings that have gone out of fashion. For example, my pepper grinder is filled with a combination of grains of paradise, long pepper, and cubeb. It makes this really amazing and complex blend of pepper flavors that was all the rage in the Middle Ages. Smoked salt is an easy thing to add to the pantry, but even with that, there is an amazing variety. Try a salt that's been smoked over Irish whiskey barrels, or honeycomb, or made as a Viking might have, on a beach with driftwood and seaweed, and you'll never think about salt the same way again. What's the strangest request you've received from one of your readers? What other fantasy series are you a major fan of, and would like to create recipes for? This page was last modified on 9 March 2019, at 20:10.